Bochka is Andrey Dellos’ first Moscow project – a wine restaurant and one of the oldest steak houses in the city. The chalet-style interior inspired by the medieval chivalry designs, a stunning range of diversely prepared meat dishes together with an excellent wine card – all this makes it an ideal venue for your banquets. Whether you are planning a birthday celebration, corporate and other social gatherings, the place will comfortably host any events, men-only parties in particular. — barbeque hall where a whole young bull is spit-roasted in the middle of the hall (seats up to 60 guests). You can arrange a standing reception for 70-80 guests or book the whole restaurant for your event. Any dishes from our menu, wines À la Carte, tailor-made designer cakes and desserts will be served to your table. 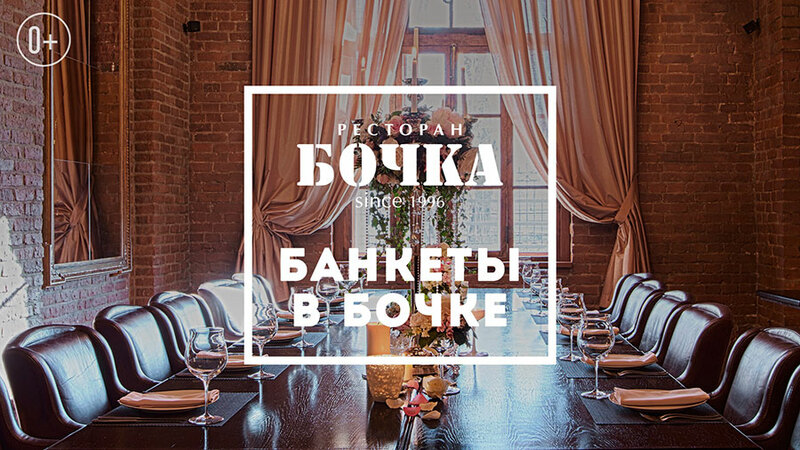 Customers who have had their birthday party at Bochka Restaurant can benefit from a 20% discount during one week following the date of celebration. Bochka Restaurant has prepared a special offer for adults and responsible guests. On Saturdays and Sundays you can order unlimited wine, vermouth and other alcohol. The offer is available for the price of RUB 1,950.